The Portland Press Herald collected and analyzed 2016 payroll information from 12 communities in the greater Portland region. The data is presented here for you to explore. * Earnings can include salary, plus overtime pay, retirement benefits & other compensation. Men hold nearly all of the top jobs in local government, while women account for more than half of school employees who earned at least $100,000 last year. 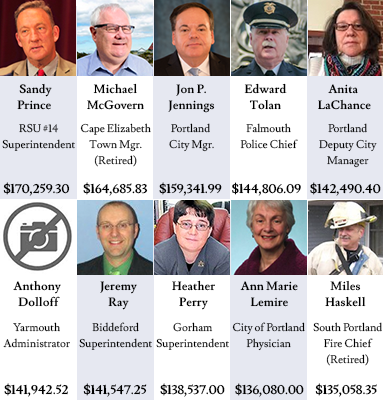 Here are the breakdowns by gender of the 138 public employees in 12 greater Portland communities who earned at least $100,000 in 2016, and gender breakdowns of the chief executives in those communities.